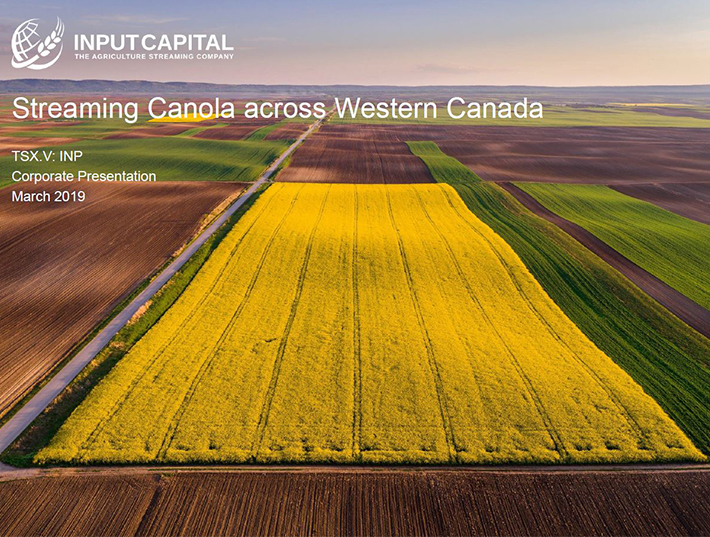 REGINA, Sept. 12, 2017 /CNW/ - Input Capital Corp. ("Input", or the "Company") (TSX Venture: INP) (US: INPCF) today announced that it will be presenting at the Sidoti & Company Fall 2017 Conference on September 28th at 2:30 PM EDT at the New York Marriott Marquis Hotel in Times Square, New York City. Input President & CEO Doug Emsley will be presenting at 2:30 PM, as well as meeting with investors throughout the day. Sidoti & Company is the preeminent, institutional-quality equity research provider on Wall Street covering small- and micro-cap equities. We are building interest and visibility into the most overlooked, undervalued segment of the equity market. Sidoti & Company aims to unite small- and micro-cap companies together with quality investors. Sidoti & Company, LLC is Wall Street's preeminent provider of equity research generally focused on companies with market capitalizations of under $3 billion. We cover over 250 companies across a range of industries. The companies covered by our traditional research typically have a history of profitability, maintain strong balance sheets, and tend to have limited, if any, coverage by other Wall Street firms. Our approach affords institutional investor clients a combination of high-quality research, a small- and micro-cap company focused nationwide sales effort, broad access to corporate management teams, and extensive trading support. We serve nearly 500 institutional clients in the U.S., Canada and the U.K., including many leading managers of portfolios with $200 million to $2 billion of assets. We believe that these asset managers are generally underserved by other larger brokerage firms that typically target larger managers. Sidoti also hosts a fee-based biannual conference in New York, and is a provider of company sponsored research. We are a broker-dealer registered with the SEC and a FINRA member firm. We provide a broad range of securities-related services. In addition to our high-quality research, our sales and trading services are distinguished by prompt execution, a competitive commission structure and access to smart order routing that utilizes all available sources of liquidity. From time to time, we are invited to participate as an underwriter, dealer, placement agent or initial purchaser in securities offerings for issuers for which we provide research coverage. Given our knowledge of the companies we cover, we believe that we are able to contribute to these capital-raising transactions. We also assist our issuers with stock repurchase programs, block trades and organized (Rule 10b5-1) trading plans. For those interested in attending, please contact Caitlin Adams at conference@sidoti.com or visit https://www.meetmax.com/sched/event_43487/~public/conference_register.html?event_id=43487&bank_access=0 for more information.